First tip – don’t fall out! I love photographing landscapes and cities from above in helicopters, planes etc. and if I could have my own helicopter and pilot for a whole trip I would. I’ve done enough flights now that I want to share a few tips with you. Some of the advice are for photographers like me who have to go on scenic flights and can’t afford to just rent my own aircraft to fly me and just me around a whole day – but most of the advice will work for everyone. Scenic flights can be expensive so I’ll try to help you get the most out of them. I’ll start off with a shot that I really like and that I’ve just processed. It’s the gorgeous and magnificent domes of Kata Tjuta in Australia shot from a helicopter at sunset with my Canon 5D and 24-105mm L f/4.0 lens. Click to see larger size on my gallery. Reflections. Especially bad in old fixed wing planes with old scratched windows. The curse of the plexiglass can ruin any good photo! A lot of the following tips deal with how to avoid them! If you can get a flight with the doors off then do it – and strap yourself in with a harness or something, it’s very possible to unbuckle your seatbelt with your camera strap! I’m sure you will get some great shots if you fall out but they will be your last! If you can’t fly with the doors off then some of the modern helicopters used for scenic flights actually have windows. Talk to and befriend the pilot, tell him you’re a photographer etc. Most of them are happy to help you get shots. If you’re sharing the flight with other passengers try everything you can (beg, bribe etc!) to get the front seat next to the pilot – it’s by far the best. Watch your feet and hands though as you sit in the front, the pilots usually don’t like it when you help fly the plane! Consider when you want to go. Sunrise and sunset has the gorgeous light of course but do pose big problems with reflections since the sun is shining directly into the helicopter or plane meaning everything reflects into the windows. I always go for sunrise and sunset light, but it does mean that half the time you can’t shoot much because you’re pointed straight into the sun. Wear dark clothes with long sleeves, take off your watch etc. This does help A LOT actually. A light coloured T-shirt and your watch etc. will create big intrusive reflections, dark clothes do not reflect as much light. If you can’t get the seat next to the pilot then make sure you sit on the opposite side of the pilot. The pilots always have a tendency to turn the aircraft away from themselves allowing the max number of passengers to see on the other side. Not great though if you’re stuck in the same side as the pilot! Test your headset, make sure it works so you can talk to the pilot during the flight. Have all your gear prepped and ready! You don’t want to change memory cards and lenses etc when flying if you can avoid it. Measure the light just after take-off, select appropriate iso setting etc. Shutter speed. Helicopters are actually very steady and you can get good sharp shots at low shutter speeds like 1/100 or even lower. Planes are much more unsteady and you need at least 1/250 and preferably higher. Aperture. If your lens is sharp wide open then shoot at a wide aperture like f/4.0 or f/2.8. You need it to get a fast shutter speed and this also greatly minimizes the chance of getting sharp well defined reflections in your shot (since everything close to you will be very out of focus). Lens. This is a tough one. You need a good all-round lens for this. I usually shoot with my 24-105mm L f/4.0 lens, it’s a great lens, gives me wide angle and some zoom. I have also used my 17-40mm L f/4.0 lens at times, it depends on what I’m shooting. Don’t fit a mega zoom, you really need a compact lens since there is usually no space in an aircraft to use a big camera with a big zoom. Lens hood. A no brainer but use this! Very handy also for protecting the aircraft. If you scratch the window of a helicopter with your lens then the pilot will likely chuck you out the door. Those things are expensive! Polarizer filter. I’ve only used it for shooting the Great Barrier Reef from above otherwise I won’t bother. You have enough to concentrate and worry about while trying to photograph from the air without fiddling with a polarizer. Can also sometimes enhance window reflections, not really what you want! If you feel comfortable doing it, use manual focus and manual settings of aperture and perhaps shutter speed. Your camera’s light meter and autofocus can get really confused by the changing light conditions and reflections so manual control is better. You do have to be fast on the dials though. I normally go with manual aperture, manual focus and auto shutter speed which I measure manually using exposure lock button on the camera. Motion sickness. Helicopters are very steady, planes much more jumpy and unsteady and some places (see my previous post on Kakadu National Park) provide mega turbulence. It’s easy to feel a bit motion sick staring through a viewfinder even in a steady helicopter, so learn to shoot with both eyes open! Composition. Remember you can always crop later and remember to shoot heaps so you have lots of material to work with. Remember also that the rotor is hardly visible to the human eye as you sit in the aircraft – however on your photo at 1/500 of a second it’s very visible! So zoom in a bit and try to avoid getting the rotor in the top of your frame. Finally – Shoot!! Shoot away, machine gun your camera! You want to come home with lots of shots that you can edit and crop and work on later. Get heaps of shots, shoot shoot shoot! Do make a note of what worked and what didn’t so you don’t repeat your mistakes next time. Remember to thank the pilot and get his card and give him yours, you might be back someday and maybe they’ll visit your site and remember you. Sometimes I get back from flights with shots that obviously are hero shots right away. Most of the time however photos shot from high altitudes need work before the hero shots emerges from the RAW files (you shoot RAW of course!). From high altitudes things get a bit hazy as well. Usually the white balance is off, the exposure is maybe a bit off, the contrast is lacking, the photos are a bit flat and lifeless – and quite often they need some cropping and straightening. So don’t feel disappointed, just get to work, your hero shots are in there in the RAW data but you have to dig it out (like any RAW shot really). This is during sunset, with little but very gorgeous light so I am using iso 500 (which on the 5D is still very clean). I am sitting next to the pilot in a helicopter with no windows and with doors – I am shooting at f/4.0 with my 24-105mm lens through the glass and fighting reflections. I am using manual focus, manual aperture and auto shutter speed which I have measured off the rock using exposure lock. I am also shooting while our pilot decided to do a sharp turn to the left, throwing off the composition completely and tilting my shot 11 degrees! Even though the exposure and focus is spot on it’s almost a total failure, and I only managed this one shot from this angle because of the steep left turn of the helicopter. This is very much a shot I had to rescue from the RAW file. To show you the difference , here’s a screenshot from RAWshooter allowing you to see how I rotated this 11 degrees ( a lot!) and cropped to rescue the shot. I then cloned away the bit from the helicopter dash board in the lower right corner and I ended up with my hero shot! I hope some of this is useful for you the next you’re photographing from an aircraft. Feel free to comment or email me if you have any questions, or want to share some great stories of shooting from above! If you go to my website and view my Australia gallery I have many more shots of landscapes and cities from planes and helicopters. On the road I posted quite a few photos and wrote quite a bit about Kakadu National Park, especially in the posts from Hawk Dreaming – but I also did a scenic flight over Kakadu that I never had time to write about before now. This week I went through some of the photos from the flight and was surprised to find some that I really liked, I remember initially being very disappointed because the shooting conditions were incredibly difficult – more about that later. Here’s the tale of Kakadu from above. 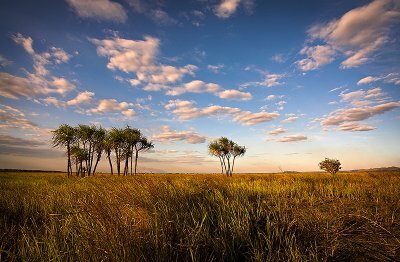 You can do scenic flights over Kakadu from either the township of Jabiru in the park – or from Darwin. I took off from Darwin airport in a small plane with four fellow passengers and one pilot on a very early Monday morning. From Darwin it’s about an hour of flying time to get to our pitstop in Cooinda in the park. It is just after sunrise and the light is brilliant. It is a very hazy morning though making photography hard with very little light to work with. At least the air is still cool from the night so no turbulence – yet! We fly over the amazing South Alligator river where we spot crocodiles on the banks heating their bodies in the morning sun. We see the wetlands of Kakadu (the bit that’s still wet in the dry season) and the Yellow Waters Billabong and the little tour boats. 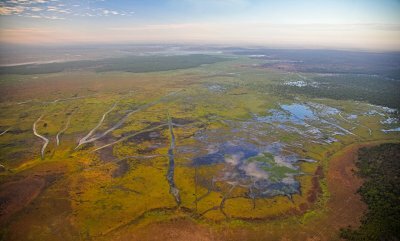 It’s a beautiful flight and the only way to experience the scale of Kakadu national park – you really get a sense of the nearly 20,000 square kilometers of Kakadu from the air. The photo above and the following two are from the morning flight. We touch down at Cooinda for an hour and a half, allowing people who wish to do so to join the Yellow Waters cruise. I’ve actually done that yesterday so I re-visit the amazing Warradjan Cultural Centre (the best cultural centre in Kakadu). At about 11am we jump in our plane again and take off for the Escarpment and then back to Darwin. Now by this time it’s about 35c degrees, the sun has burned away all the haze and heated the air – a lot! Because of the hot air and the cyclone strength winds coming off the tall Escarpment plateau we have turbulence like I have never experienced before. The plane is jumping up and down like some huge hand of a weather god is shaking it and it quickly gets extremely hot and uncomfortable in our little cabin. Two of my fellow passengers use their complimentary plastic bags and say hello to their breakfast again! I try to shoot photos but looking through the viewfinder is impossible so I just point the camera and shoot blindly out the window and concentrate on keeping my own breakfast down (I succeeded fortunately!). Here’s the spectacular Escarpment that’s causing the spectacular turbulence! Looks majestic, quiet and peaceful doesn’t it! Well in our plane it felt like the perfect storm! I love flying but when we touch down in Darwin again I am actually a bit happy to be on terra firma again. Even for me that turbulence was a bit too much and the rest of the day my balance is off. With the turbulence and the haze in the morning, photography was difficult and looking through the photos in the evening I was initially very disappointed with what I got. But revisiting the shots now with some work on the RAW files in Rawshooter there are actually a few that are fine and I’m pleased to have shots of Kakadu from above. Looking at them now is almost giving my stomach some not so pleasant flashbacks! 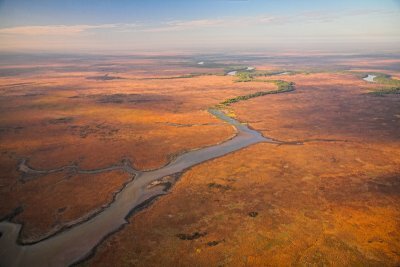 See more Kakadu aerial shots in my Kakadu gallery. It has been an exciting and eventful and beautiful Kakadu flight certainly and thank you for flying Flemming Bo Airlines! Best tour and place: Hawk Dreaming tour by Aussie Adventures, nothing comes close, nothing ever will. My very own private tour in the unique spectacular closed-off Hawk Dreaming area of Kakadu National Park with the best landscapes and aboriginal art I’ve seen in Kakadu. Add to that the brilliant guide Andy, great caretakers Michael and Alicia at the bush camp. It was just perfect and have spoiled all future tours for me! Best road music: Johnny Cash – driving through the bush and listening to country is a perfect match (and I admit I prefer Cash to Aussie country like Slim Dusty or John Williamson). Powderfinger also goes down really well with the outback. Best TV-show: The Chasers War on Everything. Brilliant. Best photo: I couldn’t possible pick just one photo, so you pick one from my gallery! Best non-Aussie accent: The fantastic people I met from Tennessee in Cairns. Think Forrest Gump in the rainforest! Best venomous snake: Western Brown Snake because I actually saw one in Kakadu! Best place: Uluru and Kata Tjuta and the entire red desert of central Australia. Feels like home to me! Equipment problems: Only one major failure really, the day my Canon 5D didn’t recognize any memory cards (and I subsequently had a heart attack). A reset (removing battery) did the trick fortunately. Minor failures: broke my Sony GPS. My left foot gave up during the last week. My left shoulder now hates my camera shoulder-bag. Number of spots on sensor: far too many to count! Switching lenses in the desert doesn’t help 😀 Anything shot at f/11 and f/16 looks like I sneezed on the sensor and needs a lot of cloning work to remove spots! Stuff I forgot at home: Somehow I managed to forget to bring the lens hood for my 17-40mm f/4 L lens at home and I’ve used that lens every day. Bugger! Oh well, not the worst lens hood to forget. At 17 mm on a full frame camera a lens hood makes very little difference anyway, the field of view is so huge. Number of Coke Zeros consumed: countless! Number of times I fell over while trying to exercise: don’t ask! “KT Tunstall – Suddenly I See” – that song is ridiculously catchy! Rightyo – back to work and dreaming up the next trip! 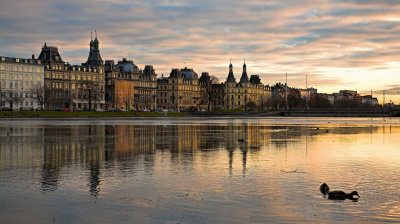 I love Copenhagen but absolutely despise Winter, the cold, the darkness, the snow. I miss Australia and the heat. 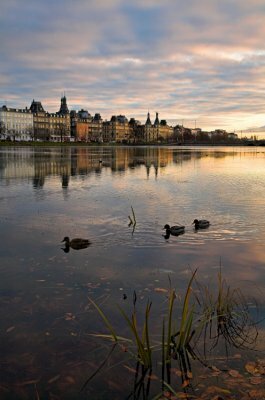 I have to admit though that the light and the clouds at this time of year can be absolutely fantastic, so at least Winter in Copenhagen does produce some nice photo opportunities. You would definitely want to buy this book, wouldn’t you? I’ve loaded the 3108 Australia RAW files in Rawshooter Premium on my graphical workstation at home (oh how nice is it to work again on a super fast PC with 24inch widescreen monitor) and very slowly started to go through them all. It is heaps of fun and will take a really long time; every photo triggers many great stories and memories! I like it that way, should keep the trip replaying in my head for a very long time. I’ve processed and added a few new Australia photos, and there are two good examples of shooting high and low! If there’s a scenic flight available – sell your left kidney and go for it! It is the only way to capture some of nature’s marvelous mega creations like Uluru and Kata Tjuta. Shooting from a helicopter or small plane is challenging, I will do a separate post on this someday because there are quite a few tips to follow to try and maximise your changes of getting a good shot and I’ve done it enough times to have learned quite a bit. I no longer update my “Australia 2007 photo odyssey” gallery, it will exist for a bit longer but it was a temp gallery for the trip. All the photos from that gallery have been copied to the new Australia galleries. New Australia photos will be uploaded to my What’s New gallery and at the same time copied to the relevant Australia gallery. …now, gotta look for that graphical designer, need a logo that looks professional and not like amateur hour! I am presently working on the structure and design of my website. I have added a small slideshow and a Google custom search function to the front page and created a much needed page with information about purchasing my photos (have also added that to this blog). I am creating a new Australia section of my site with the best of my many Australia photos structured into smaller galleries like Sydney, Uluru etc. hopefully making it easier to find what you’re looking for – if not there’s a search button for ya! A lot of the old photos were holiday snapshots and have been deleted. The remaining old Australia photos from slides that I still want on the site will be re-uploaded in much better quality, having now been scanned on a slide scanner at 4800 dpi and 16-bit colour in the fantastic Vuescan software. It’s like breathing new life into my old slides and scanner, Vuescan is that good! Still to come in the Australia section: galleries with Best of Australia and Panoramas of Australia and a clickable map showing you the geographical location of my galleries AND lots of new images. Everything is still very much work in progress, but have a look at the site and tell me what you think! Well, so far so good, the structure I can do but…as for the design of my logo and front page….I can shoot photos but am definitely not a designer! The front page and especially my logo and logotype is nowhere near how I want it to look. I have to hire a pro designer to do this, everything I design ends up looking like what it is – amateur hour! So a new front page is coming at some point but untill then let me know what you think! Title is from a good old ‘Love Shop’ song, contrary to that song’s lyrics I do know why I went travelling and I miss Australia, but it is also super nice to be back in the city that I do really love and call home – Copenhagen. Now that I’m Wide Awake in Copenhagen again; I have to get back to that plan about making a plan.